"Everything has been photographed. Accept this. Photograph things better." In this age of intensive social media, where people seem to be in a race to photograph places that are more and more exotic, out of the way, and difficult to get to…….it is perhaps a good time to remember that the degree of difficulty in obtaining a photograph does not directly correlate with how good or emotionally moving it is. The greatest challenge, in my mind, is to stay where you are and photograph and make beautiful the nuances of the everyday things around you. To see them in a fresh way. Remember that everything HAS already been photographed. I couldn’t agree with this more. It’s step one to making a meaningful photograph. Another way of saying that it is important to go ‘beyond the handshake’! “A lot of photographers think that if they buy a better camera they’ll be able to take better photographs. A better camera won’t do a thing for you if you don’t have anything in your head or in your heart”. So true. When people ask me if they should get a better camera I usually tell them that these days, unless there is some very specific and special attribute they are looking for, all a better digital camera will do is to allow the images to be printed larger. And if you are going to print them large they ought to be good to start with. It’s really difficult to make an excellent photograph. "As a matter of fact, nearly all the greatest work is being, and has always been done, by those who are following photography for the love of it, and not merely for financial reasons. As the name implies, an amateur is one who works for love." So there you go.....it couldn't come on better authority! "Quit trying to find beautiful objects to photograph. Find the ordinary object so you can transform it by photographing it." My interpretation: you don't have to run to Antarctica or even Iceland to make great photos. Look in the woods near your house. The ones that you can walk to. There's great stuff there. And you can really get to know it and visit in all kinds of conditions. It's just harder to make a great photograph there because you've seen it so many times. Familiarity breeds complacency. And because there's not a 100 foot waterfall there. Well, not in my woods anyway. However, you can go on line and find thousands of images of icebergs and penguins in Antarctica, but probably only a couple hundred shots of those woods near your house. There is opportunity there. I'm rambling a bit....free flow of thought. But I think there is something to it! Go into the arts. I'm not kidding. The arts are not a way to make a living. They are a very human way of making life more bearable. Practicing an art, no matter how well or badly, is a way to make your soul grow, for heaven's sake. Sing in the showrer. Dance to the radio. Tell stories. Write a poem to a friend, even a lousy poem. Do it as well as you possibly can. You will get an enormous reward. You will have created something. I happen to see this quote posted on Facebook, of all places. I love Kurt Vonnegut's novels and I love this quote. If ever one needed a reason to photograph, there it is! Above all, it's hard learning to live with vivid mental images of scenes I cared for and failed to photograph. It is the edgy existence within me of these unmade images that is the only assurance that the best photographs are yet to be made. A photographic quote wishing good light to all for the New Year! "Photography, as we all know, is not real at all. It is an illusion of reality with which we create our own private world." I am always looking for quotes about photography and truth. This one says it with no holds barred. Newman is one of the greatest portrait photographers of our time. One of his most noted portraits is that of Alfred Krupp, a German industrialist who had been a Nazi and used slave labor during WWII. Newman was taking Krupp's portrait for Newsweek and took the opportunity to use photography to make Krupp look like the devil, and Newsweek did publish the portrait! "................Perhaps the most famous was a sinister picture of the German industrialist Alfried Krupp, taken for Newsweek in 1963. 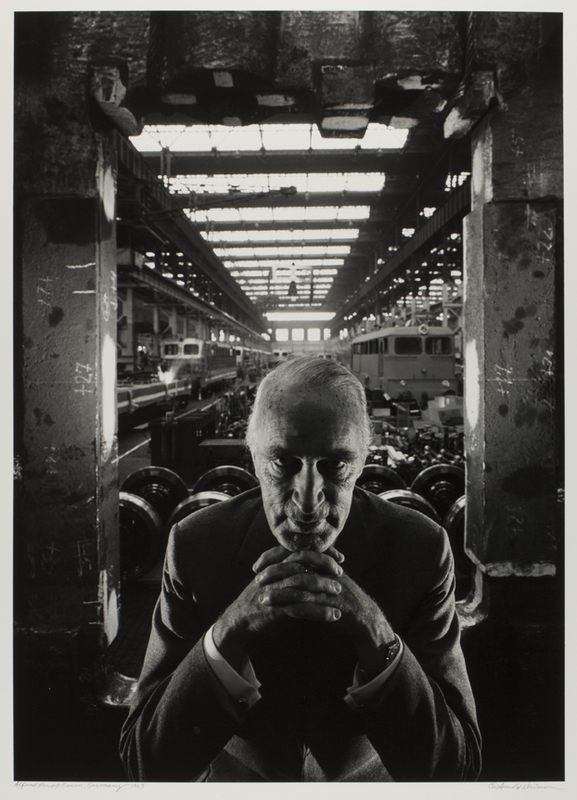 Krupp, long-faced and bushy-browed, is made to look like Mephistopheles incarnate: smirking, his fingers clasped as he confronts the viewer against the background of a assembly line in the Ruhr. In the color version his face has a greenish cast. The impression it leaves was no accident: Mr. Newman knew that Krupp had used slave labor in his factories during the Nazi reign and that he had been imprisoned after World War II for his central role in Hitler's war machine. "When he saw the photos, he said he would have me declared persona non grata in Germany," Mr. Newman said of Krupp......."
If you happen to subscribe to the blog by email, the video and its link will not come over....visit the main blog at www.howardgrill.com/blog to watch the two minute story. Today, as a break from images, I wanted to offer some quotes that have moved me and made me think about expression in photography.....but this time from artists that are not photographers; though the medium really doesn't matter. From words to paints to pixels, the reasons for expressing are the same. "The object isn't to make art, it's to be in that wonderful state which makes art inevitable." All four quotes, I believe, really point to ideas worth contemplating. The point of living a creative life - rather than just engaging in creative pursuits on occasion - is not merely to produce aesthetically pleasing artifacts, but to bind one's creative work and living experience as two dimensions of the same life in all its details, always unfolding and evolving in parallel. The photographs - mine and others - that I consider most favorably are not those that merely serve as visual trophies for enduring some difficulty or experiencing a stroke of good luck, nor those relying entirely on interest and aesthetics inherent in the things photographed. Rather, they are those photographs that express a photographer's passion for - and harmony with - the life they live and the things that make such a life better and elevated in their own mind: not photographs of objective things, but photographs about subjective things. I thought these two quotes from Guy Tal's recent LensWork monograph offered quite a bit to think about in terms of how to breathe life into one's photographs. The artists vocation is to send light into the human heart. ".....people feel that Ansel's famous 'Moonrise, Hernandez, New Mexico' was a special moment in time when, in fact, it's an image so greatly manipulated that it can truthfully be stated that the moment never occurred. It was largely created. The actual moment was used as a starting point for the image, while the image is a dramatic alteration of the starting point. It is a wonderful interpretation of that moment by Ansel." I don't think there was ever a time when creative choices didn't play a role in fine art photography. From time to time I reference my article 'Photography And Truth', and this quote applies to that concept quite aptly. I read this quote by Galen Rowell and said to myself.....now there is part one of the answer to the eternal, infernal question "did it really look like that?" This quote really speaks to me. At first glance the two ideas may seem similar, but they are different as night and day. To capture the past means you can look at and remember it. To bring it into the present means that, to some extent, you can re-experience it. A good photograph is one that communicates a fact, touches the heart, and leaves the viewer a changed person for having seen it. I love this quote because it speaks about what photography means to me. It is when I'm out with my camera that I really begin seeing and start to realize the potential of what things can truly look like if viewed in different ways. Funny how you sometimes have to put something in front of your eyes in order to use them to their fullest. I think that this is the key initial step to making photographs that effectively communicate something. I believe it goes for any type of image: portraits, landscapes, macro, sports. Anything. Extraordinarily well said by Don McCullen! Photography is a portal to your imagination. It's as simple, and as complicated, as that. How true. What else is there to say? I do love the juxtaposition of the words simple and complicated. "It is important for us not to compare our work to the work of others, as challenging as that may be. It is simply human nature to look outside ourselves, rather than face that which exists internally. Comparison is ego based and unproductive in the long run"
What do I think of the book overall? A bit of a difficult question. When I wrote this post and scheduled it for the New Year I was only about a third of the way through the book. Now I'm two thirds of the way through and my opinion is a bit different. Let me explain. 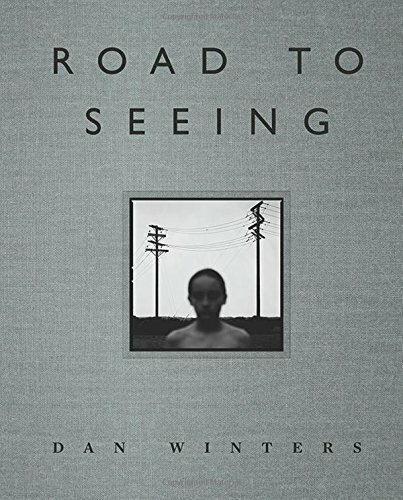 The first part of the book is focused on Winter's adolescence and early adult life as he winds his way through finding his calling and 'advancing' through the various stages of becoming the renowned photographer he is today. It is this part of his writing that I found most compelling, as it includes insights into 'seeing' and interpreting life via photographs. The middle third of the book, where he talks about specific 'celebrity' shoots, how they evolved, and his ideas behind each of the sessions I found far less compelling. Yes, it was of some interest to hear Winter's thought process behind each shoot but the section lost, at least for me, the message value. Maybe it is because I don't shoot many portraits. Maybe it is because I won't find myself photographing celebrities. At any rate, I found the focus to be more on the celebrity than the 'bigger' message. And of course none of this should detract from the fact that the photographs are both beautiful and beautifully reproduced. At almost 700 pages it is hardly a quick read, but, as we said in high school, it goes quickly because there are lots of (gorgeous) photos. At $60 it also isn't a 'casual' book purchase. I hesitate to give a final opinion as I still have another third or so of the book to go, but I would have to say that though it has 4.5/5 stars on Amazon I would personally only give it a 3 overall, though it clearly has 5 star moments! "Reaching a 'creative' state of mind through positive action is considered preferable to waiting for 'inspiration'." I have been doing a fair amount of reading about the creative process lately and this quote sums up a good deal of important information. Inspiration, at times, just arrives. But the vast majority of the time it comes to those who are working, and working hard, at creating. It's the 1% inspiration and 99% perspiration thing. It reminds me of the time I asked my teacher, the late Nancy Rotenberg, how to work through those inevitable periods where it seems like you can't find anything that inspires you to make photos. Her answer was to just get the camera out and start photographing whatever is there in front of you. Work at it and the inspiration will come. She was quite wise!